Kevin Friend had a bit of a mare just before half time at Old Trafford on Saturday. 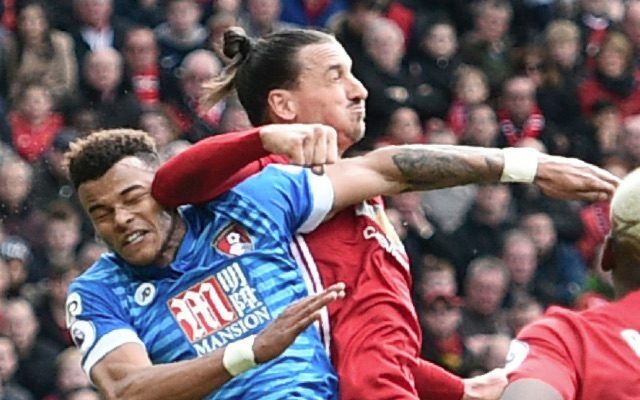 The referee failed to send off Bournemouth defender Tyrone Mings for stamping on Zlatan Ibrahimovic’s head. And then Friend let Manchester United striker Ibrahimovic go unpunished when he retaliated by elbowing Mings in the skull. Someone did get sent off, though. Andrew Surman was given his marching orders for picking up two yellow cards. His first caution was for a hard (but perhaps fair) tackle on Luke Shaw, before he was shown yellow again for a tame shove on Ibrahimovic in the direct aftermath of his elbow attack on Mings. Incredibly, Friend seemed to forget that he had already booked Surman and there was a good few minutes between the flashing of the second yellow card and the resultant red. Although Friend just about managed to avoid a repeat of the infamous Graham Poll mistake, as the ball was not in play from the time he produced the second yellow to when he drew the red from his pocket, his failure to dismiss Mings or Zlatan will surely haunt his referring dreams tonight. To make matters worse, Zlatan was already on a yellow, having been booked for complaining about the award of a nailed-on penalty.